We make your dreams come true! November 12, 2013. 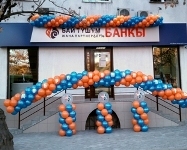 A new office of Bai-Tushum and Partners Bank opened in the city’s business center on 104 Chui Prospect (intersection with Tynystanov Street). This office offers customers bank services at a new quality level. Modern interior and comfortable servicing of customers make the process of servicing more enjoyable, fast and efficient. “The Bank’s new office opened under the large-scale project to improve the quality of services for small and medium businesses. To this end the Bank launched a unique program of lending to small and medium businesses, which provides comprehensive solutions enabling access to finance based on the scale, characteristics and seasonality of the business. The new lending program provides effective application processing: from 2 to 5 working days, the possibility of obtaining an unsecured loan in the amount of up to Som 300,000, and a wide range of banking products. The following services are offered to customers: money transfer, account opening and maintenance, placement of deposits on profitable, and most importantly, reliable conditions. Understanding the importance of affordable housing , we also increased the terms of mortgage loans up to 15 years “, – said Gulnara Shamshieva, General Manager of Bai – Tushum and Partners CJSC MF Bank. We look forward to seeing you in the new office at 104 Chui Prospect, from Monday to Friday, from 8:30 to 17:00 without a break.